Sometimes children disobey intentionally and other times it is just because they are kids. Learn the difference and how to respond in both situations. Children are not perfect humans. No one is a perfect human. Adults make stupid mistakes. We can expect no less from our children. Sometimes, our children disobey on purpose. They know better and choose to ignore you. Other times, they disobey because they simply had no idea they shouldn’t do that. Let’s discuss the difference between the two situations. 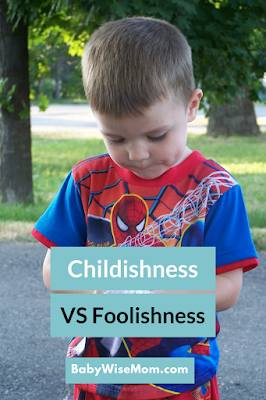 On Becoming Babywise II discusses the difference between childishness and foolishness on page 86. Childishness is on accident. It happens because your child doesn’t know or understand the rules. It is not because your child is directly disobeying you. Foolishness is on purpose. 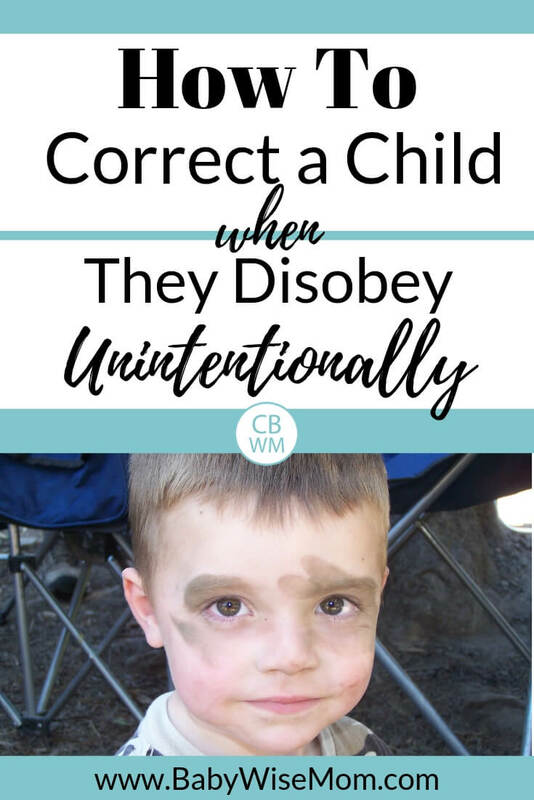 Your child knows the rules and disobeys anyway. It is important to evaluate if actions are out of childishness or foolishness because your response should be different in each case. BW II explains it this way: Foolishness is a heart problem while Childishness is a head problem (page 87). The head problem simply needs information. The heart problem is a bigger deal because your child is choosing to do the wrong thing–choosing to disobey. Both require correction, but different methods of correction. This might seem simple to determine, but if you have a child who makes both childish and foolish decisions, you know that you as the parent often evaluate the situation incorrectly. Usually, you are wrong in that you assume a childish action was done in foolishness, or on purpose. This can happen if you assume your child knows rules that haven’t been explained. You might also assume your child should make connections that he just isn’t capable of connecting. Or you might be telling your child to do or don’t do something and he just doesn’t understand what you are saying. He lacks the vocabulary to understand what you mean. For example, you might tell your child to not run. He runs anyway and you get frustrated. Your toddler will be in the preschool years before he really can use words to clarify something like that. So be sure your child knows what it is you are asking of him. The look on your face and tone in your voice will tell your baby he has done something wrong, but he won’t necessarily know what it was. Some might get it right away while others won’t. Those who don’t will usually repeat the action like a little scientist, trying to figure out exactly what wasn’t okay about what he just did. If you stay consistent, he will figure out more quickly what he did wrong. Your child will continue to be a scientist throughout his life as he grows up and tries to figure out exactly what is expected of him. One morning we were in our church hurrying to our meeting. Our son Brayden was trying to hurry also and started to run. I instructed him to not run. He was at an age where he knew just what I was talking about, so he didn’t run. He walked really quickly–you know that pace where they are so close to the run–, which wasn’t what I considered to be reverent enough for the church either. I might be able to expect an older child to know that if I tell him not to run that means he must also not walk super quickly, but definitely not a three year old. Also, I had made the mistake of telling him simply what not to do rather than adding in what to do. Further explanation helped him to know what it was I was asking of him. His quick walking in this situation was not a defiant action. He didn’t think, “I’ll show her; I’ll just walk quickly then.” His quick walking was a childish action. He did not yet know exactly what was appropriate and what wasn’t appropriate in the church. You can be sure an act was foolish when your child has already demonstrated an understanding for the expected behavior in that situation. Your child has shown she understands the rule in the past and chooses to disobey it anyway. Sometimes you will assume an action that is neither childish nor foolish was foolish. For example, one day my daughter Kaitlyn (22 Months) was sitting on the potty. She reached out and unrolled some toilet paper. This was not something I had ever addressed with her. Brayden never touched the toilet paper roll, so it hasn’t occurred to me to talk to Kaitlyn about it. This action was childishness. I told her we don’t play with the toilet paper. She told me “okay Mommy” then immediately reached up to it again. I started to give her my Mommy Glare and tell her that was a no when I realized she wasn’t reaching to play with it; rather she was rolling it back up as it was before she unrolled it in the first place. She was attempting to correct her wrong action. It is good to wait a moment to know exactly what your child is doing before you jump to your conclusion and start to discipline and correct. Life with children is never cut and dry. Here is a story to illustrate. Brayden loves certain types of blankets. As he has gotten older,we have restricted where the blankets were allowed to be. At one point, they were allowed upstairs where the bedrooms were, but not on the main level. Then we decided it was time that they must remain in his room. I told him his blanket must stay in his room. He had a day where he left his room with it several times. This might seem foolish, but it was actually childish. He wasn’t leaving the room with it having decided to disobey; he just was in the habit of carrying it around the entire upstairs and wasn’t thinking. About 60 seconds later, he declared he needed a tissue and ran out of the room with his blanket in tow. I knew that this was again a childish action. He wasn’t willfully defying me. But I also knew that something extra needed to happen for him to have reason to remember the new blanket rule. I took the blanket as promised. I have never seen him so upset. He didn’t throw a fit, he was just emotionally upset at the prospect of losing his blanket. After a couple of minutes, he calmed down. He knew he had messed up and he was ready to take the consequence. Later that day, I gave his blanket back. He was very grateful and told me he wouldn’t leave his room with his blanket any more. And he didn’t. So you can see from this story that childish actions still need correction. And just because the child understands something doesn’t mean it is automatically a foolish action. 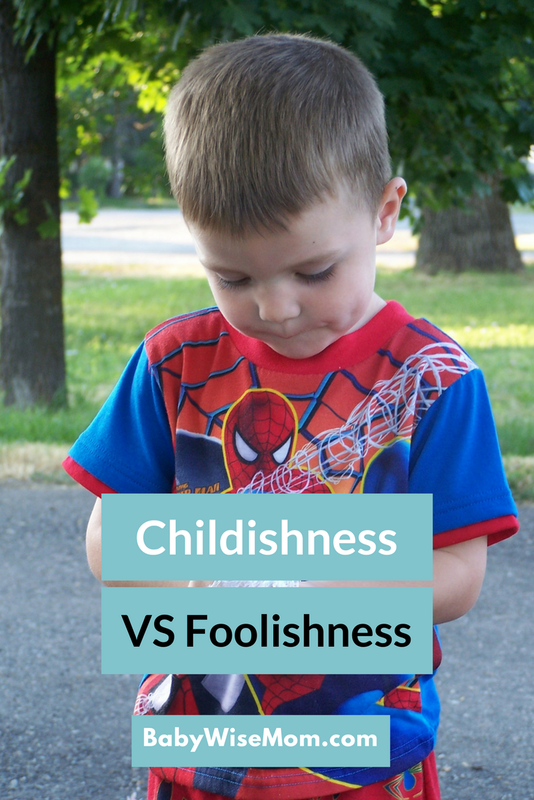 Make the effort to figure out if your child is being childish or foolish. As you get to know your child, you will recognize cues and hints, like a certain glint in the eye when the child is knowingly disobeying. You will continue to misjudge at times, but you will get to know your child better and be more accurate. Don’t assume your child knows rules. Explain things to your child as age appropriate. Don’t assume your child will realize that if something is wrong, similar things are also wrong. Be sure your child understands what you are telling him. Be sure you tell your child not only what not to do, but what to do. 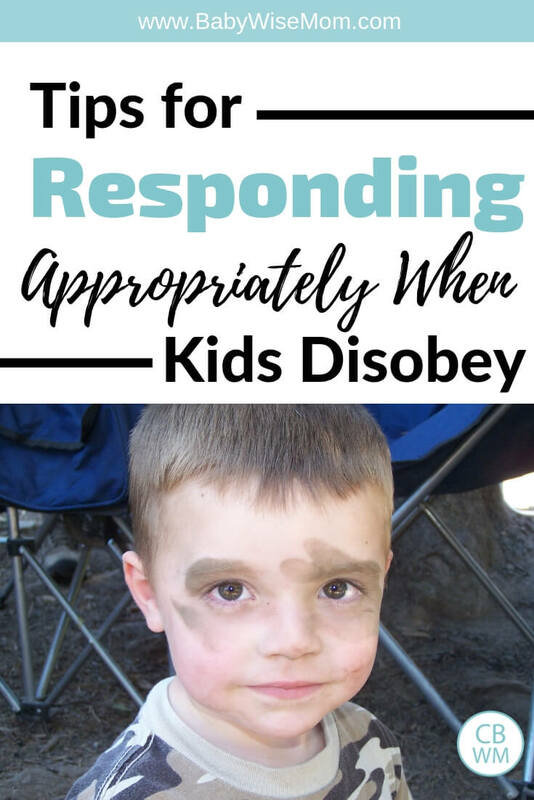 Observe your child for a moment before assuming he is being disobedient. A foolish action will require more discipline than childishness does. Exactly what you do and how you do it is dependent on the child. The child’s age, the frequency of the offense, situational context, and the child’s overall behavior all factor into deciding what to do (page 87). As the parent, it is for you to decide what to do. Be sure to see the many discipline posts for ideas. It can take time to figure out if an act is intentional or not. Be patient in both situations. Have consequences in both situations. Make your response fit the act. Any advice on how this applies to a 13 month old? Sometimes I swear I tell Brady “no touch” 3 times before he actually stops. With his age, I can see that he starting to understand what that means, but needs a lot of repitition. However, I want to set the expectation that he needs to listen the first time and respond the first time we say something. I would like any advice or ideas on a behavior issue we are having. My son is 9.5 months old. We started setting boundaries once he started crawling and pulling up and he understands “that’s a no-no”. For the few things that are “no no’s” he understands and will even back away and move on when I say his name in my “firm tone”. We recently started having an issue with his car seat. Most of the time he does great..sits right down and we buckle in and go. But recently he has started pitching a fit (not everytime but often enough for it to be an issue). He buckles his legs, arches his back, screams and won’t sit down. We firmly tell him “that’s a no no” but he doesn’t listen like he does with the boundaries in the house. Any advice on how to handle this? I guess we will just keep being consistent with this. He has been so compliant and so good with direction so I am unsure how to handle this. Thanks so much! It just seems like a lot of rules to me. 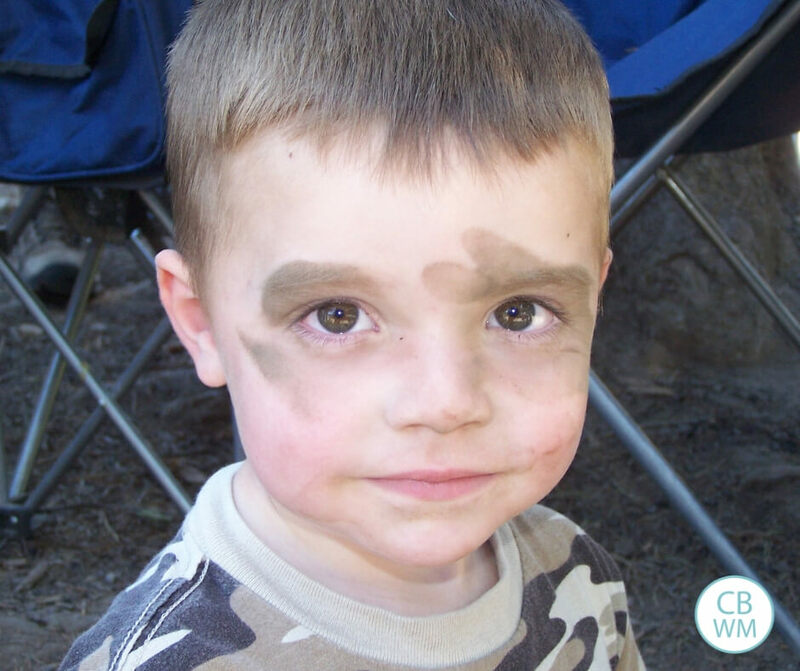 Do you ever feel like you are constantly correcting/discipling your child? That should be disciplining not discipling. Lotts,There isn’t much you can do beyond the “That’s a no-no” at this point. I would tell him also to sit still. Give him something that might distract him from having the fit (a toy, book, you singing, etc. ).I think the carseat gets to be uncomfortable (or less comfortable), not to mention very restricting. You only have a couple of months before you can move to a bigger carseat. You are right to just plan on being consistent, and add distraction. Everybody Eats,No, I don’t. I actually discipline very rarely. They are quite obedient, and I attribute that to the training I did as they were young.